What’s in my Inbox | Lots and lots of year-end emails. What can you learn? Nearly a third of all annual giving happens in December, and 12% happens in the last three days of December. How are you maximizing your year-end online campaign? If your plan has been to send out an email and cross your fingers, think again. Studies have shown a 40% increase in results when using multiple emails versus one lone message. Email is ephemeral – here today, gone tomorrow. Our standard recommended email sequence consists of anywhere from three to five – or even more – emails, with one (or even two) landing on December 31. How do you stand out in the inbox? A great subject header helps (your first priority is getting your email opened). Take a look and see a few of the emails that have landed in my inbox in the past day or two. Cuteness overload! 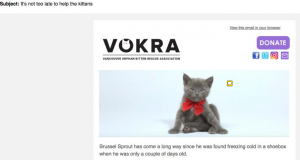 Who could resist this adorable kitten by the name of Brussel Sprout? 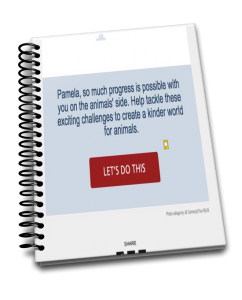 Put some pizzazz in your call to action! More $$ this week! Do you have these three “musts” in place? Next post: Are events a losing proposition for your nonprofit organization?